During the battle of the Coral Sea two US carriers was badly hit, USS Yorktown and USS Lexington. 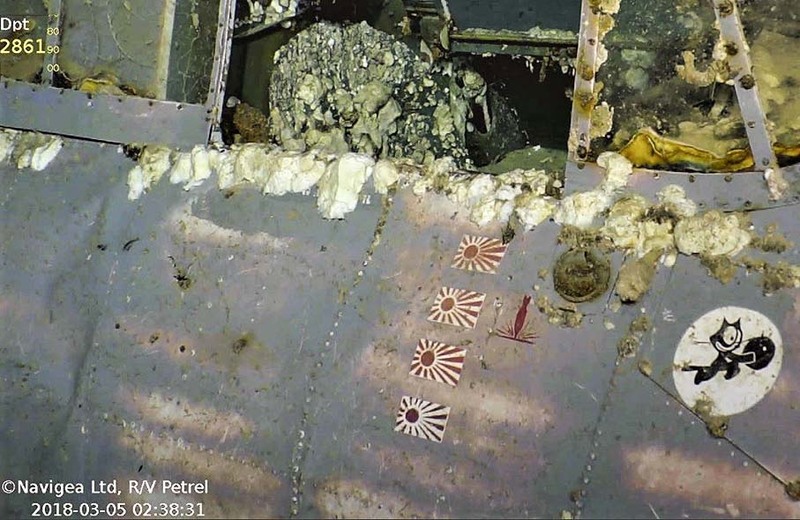 When USS Lexington started to sink on 8th of May 1942, the crew try to save here by dumping all aircraft overboard, especially the aircrafts on the right hand side of the deck that weight the carrier down. One of the fighters that went overboard was Lt. Noel A. M. Gayler´s machine. It interesting to note that during this day this machine was flown in action by Lt. Al "Schoop" Vorse. Check out the four kill-markings on Gayers Wildcat, including the bomber mission markings for an attack he made with 30-lb bombs during a Lae-Salamoua raid on a Japanese AA position.